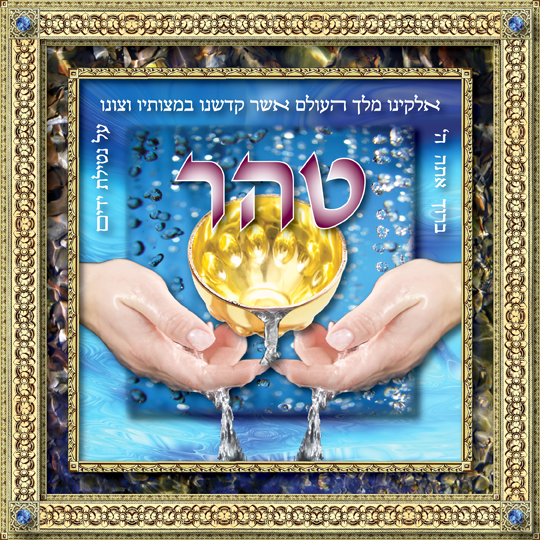 "Negel Vasser :: Al N'tilat Yadayim"
This art piece is inspired by the sacred practice of ritual hand washing, or in Yiddish, “Negel Vasser” which originated as a rite of purity performed in ancient days in the holy Temple of Jerusalem. The intricately ornate border surrounds a swirling cerulean blue background that evokes water and spirit. It is said that while we sleep, our souls ascend to heavenly levels to renew and recharge for the coming day. Our bodies, however, remain earth-bound. The act of washing upon waking and before meals clears, cleanses and removes foreign debris, aligning our bodies to our spirit. 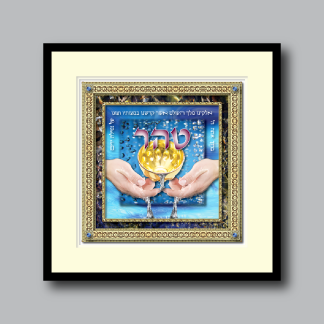 The upper portion of the image depicts the Hebrew words of the brachah (blessing) that is said while the hands are being washed. They are white, symbolizing their higher spiritual intent. These words appear to float above an unending stream of purifying water that seems to cascade from a sacred and beautiful golden cup into the accepting hands below. 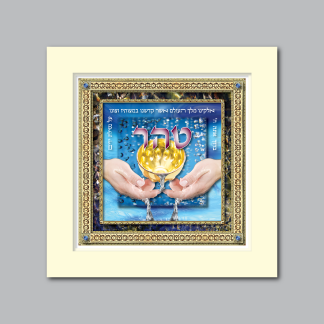 Above the main image is the Hebrew word “Tahor” meaning “Purity”. This captures the essence of the entire art piece, reminding us that even the small simple act of washing our hands can raise us up to a higher spiritual level.